StingRay Pumps are tuned to the wash manifold system to maximize StingRay parts washer performance and efficiency – each pump system blast pressure is blueprinted through our quality assurance process before leaving the factory. Pumps are tested for three 30 minute operating cycles and the performance measured at the nozzle tips. (Many manufacturers performance are based on an estimate from the pump performance curves.) StingRay high performance parts washer pumps provide shorter cleaning cycle times and remove more difficult soils. 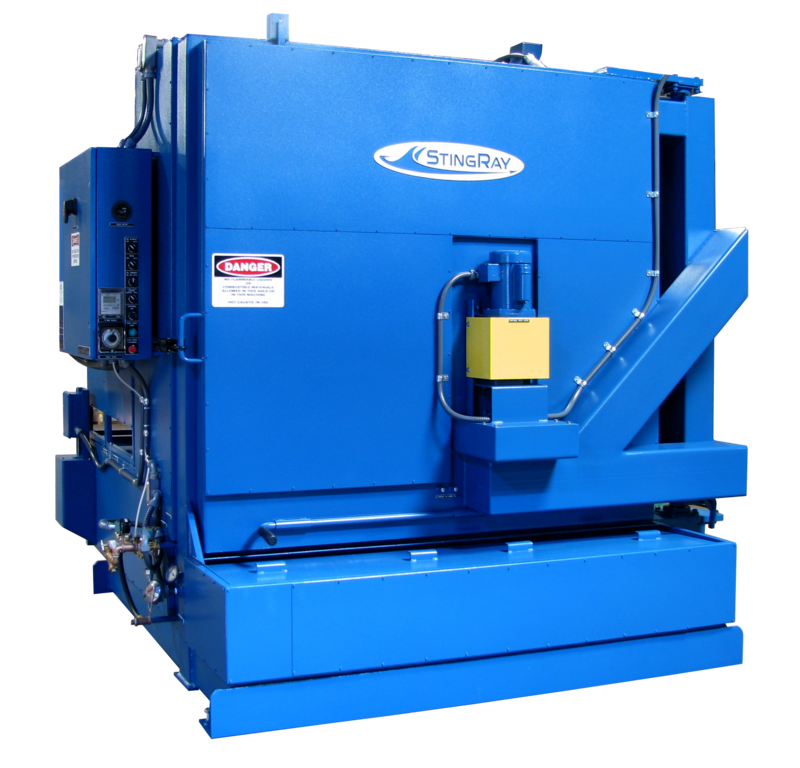 StingRay pump systems upgrades for the parts washer are available from 20 horsepower up to the 140 quadroplex. Each system is engineered for maximum efficiency when coupled with a specific wash blast spray (manifold) system. Higher pump horsepower increases the mechanical energy delivered to a specified wash chamber volume ie Higher Power Density. 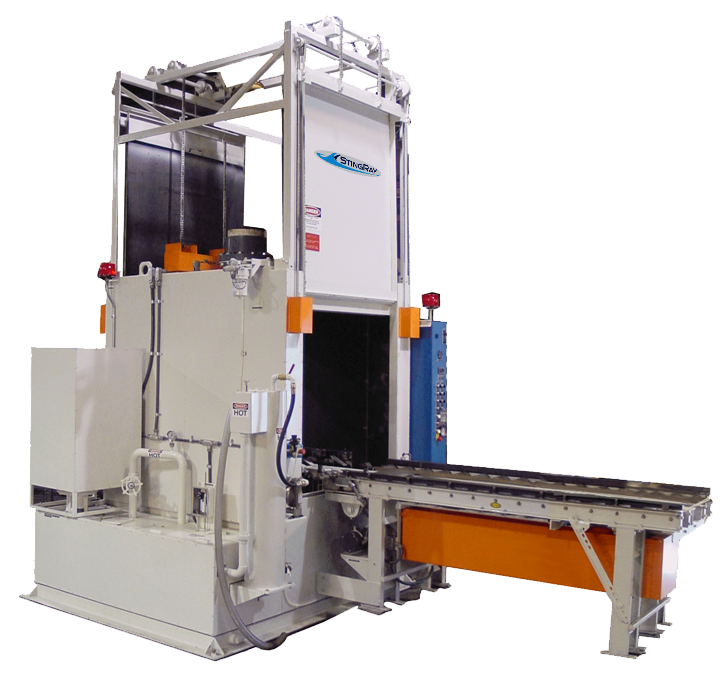 Increased power density is required to wash faster or accomplish more difficult cleaning tasks such as paint and carbon removal, aircraft wheel rubber bead, grease & oil from engine parts and so on. StingRay developed specific power density requirements for different cleaning applications and can help you determine the proper pump size to accomplish your required parts cleaning task. All StingRay pump systems are designed with low NPSH requirements allowing washing with super-heated aqueous parts cleaning solutions. The NPSH required determines the maximum operating temperature for a pump system before cavitation begins. 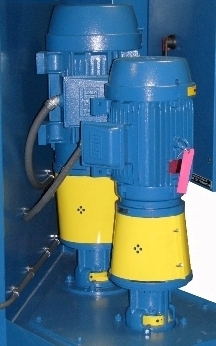 The StingRay Duplex pump systems utilize a low speed suction pump to reach operating temperatures of 200 degrees Fahrenheit or more for parts washing. 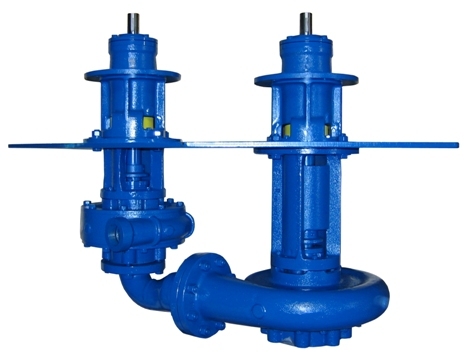 A sump mounted vertical centrifugal with a seal-less design on the wet end eliminates leaks associated with horizontal pumps. The StingRay pump capability of passing ½ inch solids, eliminates clogging. All StingRay parts washer pumps are dynamically balanced to .0072 inch oz/oz for minimal vibration and long life. 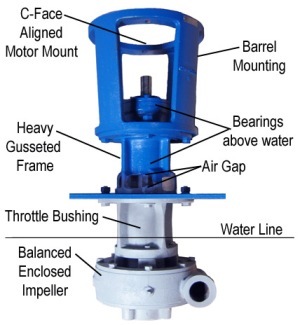 The C-Faced Motor flange mounting with a flexible coupling automatically provides perfect motor to pump alignment. StingRay pumps have OSHA compliant safety guards, hardened steel and stainless steel components for longer life, high efficiency Industrial Grade motors meeting the NEMA MG 1 standards for highly energy efficient parts cleaning.